My Name Is Isis by Susan Morgaine is the fourth book in the My Name Is series from The Girl God; a series of picture books for children. The series serves as a child’s gentle & colorful introduction to one particular Goddess per book. 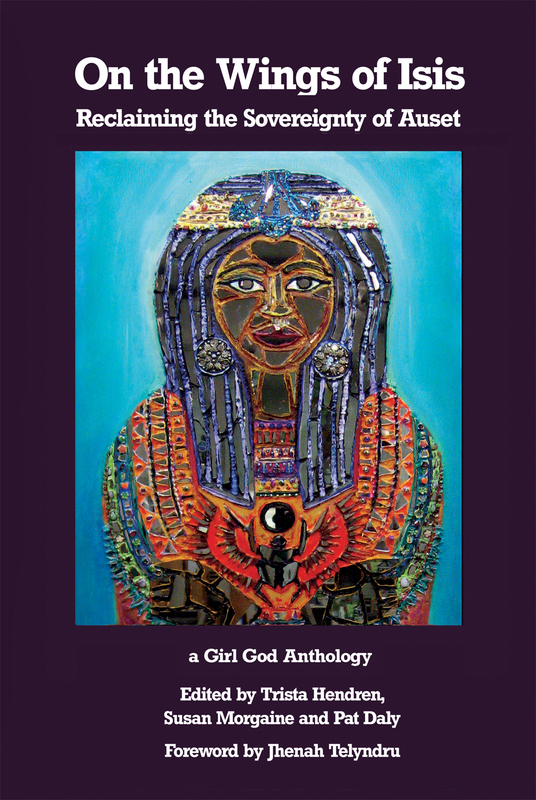 In My Name is Isis, Susan Morgaine invites her young readers into a dialogue with the Goddess. For example, when sharing Her role as Great Mother & Protector, Isis asks “Do you have brothers or sisters — or a pet — that you help take care of?” inviting the reader to consider what it means to be nurturing and protective of someone they love. The conversational style is engaging and creates an opportunity for a child to see characteristics of the Divine within themselves. The cover art and design of this particular book is not my favorite in the My Name is series. I find this one unappealing to children in comparison to the earlier volumes. However, the illustrations inside the book are luminous and include many beautiful examples of women’s bodies that serve to normalizing the sacred nature of diverse feminine forms. Many of the symbols, animals, and features associated with Isis are also depicted, such as Isis as a kite, searching the world for Her missing husband. Parents should be aware that as a part of exploring Her story, the text does touch on death & the loss of loved ones. It does so gently and encourages children to know that their deceased loved ones live on in their hearts. Sensitive children who struggle with the concepts of death, dying, or grief may need help processing these few pages. I especially loved the pages about Isis as Teacher and her firm, loving admonishments to “treat your teachers with honor and respect as they show you the things you must learn.” Teachers need a Great Goddess looking out for them and the incredible work they do every day. So, this was a sweet addition to the aspects of the Goddess Susan explores and the lessons she and Isis convey to their audience. Overall, this truly is a lovely picture book that Pagan/Goddess parents could use to introduce young children to Isis as Great Mother, Teacher, & Healer. Hopefully, Susan Morgaine will write more future volumes in the series, bringing young Pagan children into conversation with more Goddesses. Currently, the My Name Is series contains books honoring Medusa, Inanna, Lilith, & Isis. The next book in the series will be about the Morrigan. It is forthcoming and now available for preorder. As an aside, I would like to take a moment to thank the FAR community for the experience of serving as a contributor and a Project Co-Weaver over the last several years. Working with the FAR community has gifted me with many wonderful lessons and new skills. It has also played a significant role in my finding my way towards a new calling. Last July, I landed a job that brings all the things I want to do with my life — read, write, research, teach, work with children, and be of service in my community — all together. I now work as the Children’s Services Manager at my local public library and I get to do all of those things every day in myriad ways. This year, I’ve been accepted at two different universities and will begin my graduate degree in librarianship this autumn. I hope to still continue to contribute to FAR (although on a much less frequent basis) as I take on this new challenge, but I am stepping down from my Co-Weaver responsibilities. For now, I will miss being as active a presence as I have been in the past here, but I am also very much looking forward to this next adventure. I will always be so grateful that Gina & Xochitl took a chance on a 4am interview with a whacky expat mom Down Under. Xochitl, it has been such a pleasure being your Co-Weaver over the years. Thank you for all the support you’ve given me as I’ve grown into new things. I’d also like to say that I am very grateful that Katie has come aboard so smoothly to help keep things rolling here at FAR. Thanks for all your good work and more power to you as you move into a new phase in your life. As for children and death, I say more power to the author. Death is part of life and children do not need to be shielded from it. I remember my parents saying it was not appropriate for me to attend the funeral of a beloved friend of the family and I guess I never forgave them for it, for I remember it still. I second all that Carol said about your work and about the book you are reviewing. Dear Kate, what a pleasure it has been to read your posts and to work with you as a FAR contributor. You have always been so kind, supportive, and conscientious in all you have brought to the FAR community. I am delighted that you have found work that you enjoy and studies that will help open the way to more great work. I count myself blessed to have met you at the Ninefold Festival. Rage on, Sister! You’re facing more and more changes in your life, and now some new changes are taking you away from us. I’m sure we will all miss you. Thanks for all the help you’ve been to me. I hope you’ll have time to keep reading such good books. Congratulations on your newest journey. Thank you for your support and patience.